King of Egypt from 222 to 205 B.C. ; hero of the events described in Dan. xi. 11-12. The passage in question refers to battles between him and Antiochus the Great, more especially the decisive battle at Raphia (217 B.C. ), in which Ptolemy won a brilliant victory, and by that very fact showed himself to be a much more able ruler than is commonly supposed. Two episodes in the battle of Raphia are mentioned in III Maccabees also: (1) how a certain Theodotos, conducted by a Jew called Dositheus, son of Drimylus, tries to murder Ptolemy in his sleep, but fails in his purpose; and (2) how Arsinoe, sister of the Egyptian king, incites the troops to fight bravely (III Macc. i. 1-7). Both accounts originate with Polybius (v. 79), and hence are historical. Accordingly the rest of the story narrated in III Maccabees can not be pure invention, although there are absurd details in it which are doubtless due to the fact that the author is trying to glorify a greatmiracle. The author relates that after the battle of Raphia Ptolemy Philopator visited Jerusalem and declared that he would enter the Temple. By divine interposition, however, he fell to the ground stunned. When he had returned to Alexandria he thought of revenge, and caused all the Jews of Alexandria and Egypt to be bound and dragged into the arena to be trampled by his elephants; but the beasts threw themselves upon the king's troops instead. The Jews celebrated their escape by an annual feast-day (ib. vi. 36). At least this feast-day must be historical, for Josephus mentions it ("Contra Ap. " ii., § 5), placing the event, however, in the reign of Ptolemy VII., Physcon, and relating the simple fact without referring to any miracle. Schürer (l.c. iii. 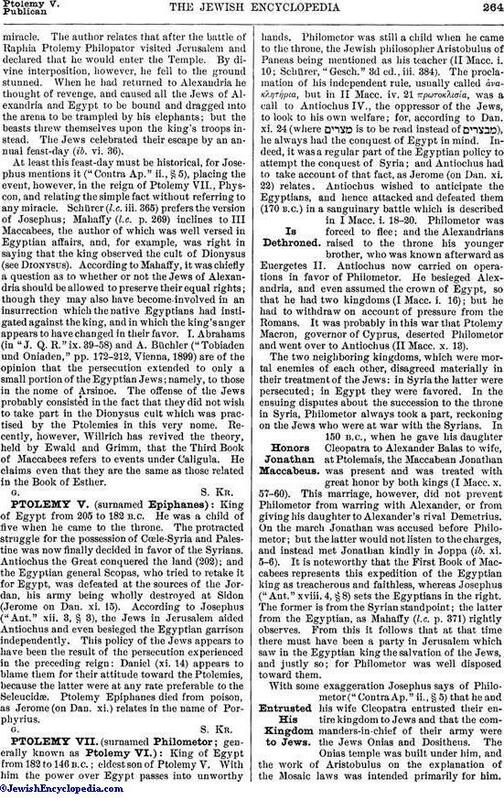 365) prefers the version of Josephus; Mahaffy (l.c. p. 269) inclines to III Maccabees, the author of which was well versed in Egyptian affairs, and, for example, was right in saying that the king observed the cult of Dionysus (see Dionysus). According to Mahaffy, it was chiefly a question as to whether or not the Jews of Alexandria should be allowed to preserve their equal rights; though they may also have become involved in an insurrection which the native Egyptians had instigated against the king, and in which the king's anger appears to have changed in their favor. I. Abrahams (in "J. Q. R." ix. 39-58) and A. Büchler ("Tobiaden und Oniaden," pp. 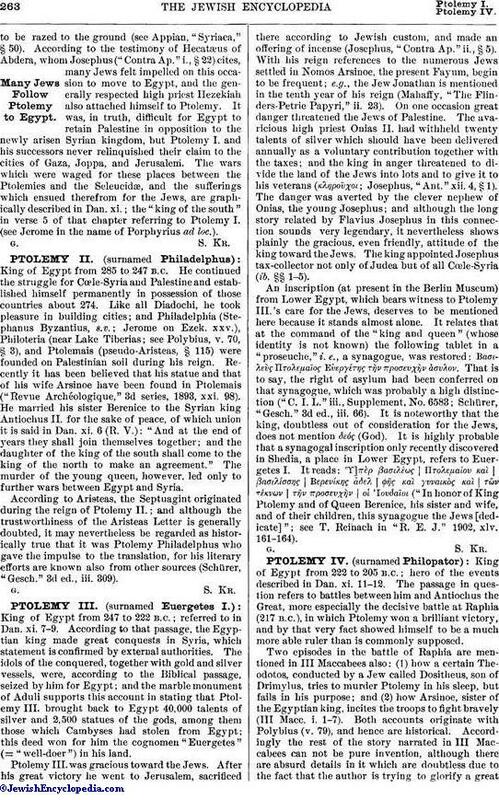 172-212, Vienna, 1899) are of the opinion that the persecution extended to only a small portion of the Egyptian Jews; namely, to those in the nome of Arshioe. The offense of the Jews probably consisted in the fact that they did not wish to take part in the Dionysus cult which was practised by the Ptolemies in this very nome. Recently, however, Willrich has revived the theory, held by Ewald and Grimm, that the Third Book of Maccabees refers to events under Caligula. He claims even that they are the same as those related in the Book of Esther.